We are thrilled to announce that Danish conductor Thomas Dausgaard will become the next Music Director of the Seattle Symphony, beginning in the 2019–2020 season! Dausgaard will succeed current Music Director Ludovic Morlot, whose tenure concludes after the 2018–2019 season. The Seattle Symphony’s Principal Guest Conductor since 2014, Dausgaard brings a highly individual approach to programming, a deep history with recording and extensive experience as a music director with several European orchestras. Dausgaard’s close relationship with the Seattle Symphony began in 2003 with performances of Nielsen’s Fifth Symphony, giving Seattle audiences a first glimpse of his creativity and dynamism. In Seattle, Dausgaard has made a point of exploring the “roots of inspiration” for composers and immersing the audience in unique, contextual experiences. In past seasons this has included local Finnish choirs spontaneously rising up out of the audience to sing Finlandia during the Sibelius Festival, and the Portland-based vocal ensemble Cappella Romana singing Russian liturgical music to introduce Rachmaninov’s Piano Concerto No. 1 and Second Symphony. A champion of contemporary music, Dausgaard conducted the American premiere of Snow by British composer Helen Grime in June 2017. Snow is part of an ongoing series of commissions in a project devised and launched by Dausgaard titled “Scottish Inspirations” with the BBC Scottish Symphony Orchestra. Enjoying connections with many of today’s leading composers, Dausgaard maintains long-term associations with Magnus Lindberg, Per Nørgård, Bent Sørensen, Sally Beamish and Hans Abrahamsen, among others. He is leading an ambitious, multi-season commissioning project with the Swedish Chamber Orchestra taking its inspiration from J.S. Bach’s Brandenburg Concertos and featuring new works by Mark-Anthony Turnage, Olga Neuwirth, Anders Hillborg, Brett Dean, and American composers Steven Mackey and Uri Caine. With over 70 albums to his name, Dausgaard joins one of America’s most recorded orchestras with its triumphant recent history including three Grammy Awards and rave reviews for many recordings on its own label, Seattle Symphony Media. Dausgaard’s projects with the Seattle Symphony include the 2016 live recording of Mahler’s Symphony No. 10 (performing version by Deryck Cooke), which was named Disc of the Year by Europadisc and nominated for a 2017 Gramophone Award. “This exceptional issue from the Pacific Northwest ought to be a game-changer for all concerned,” Gramophone wrote in the review. His most recent release on Seattle Symphony Media, a live recording of Nielsen’s Symphonies No. 3, “Sinfonia espansiva,” and No. 4, “The Inextinguishable,” will be available on November 10. “This is a joyful outcome for the Seattle Symphony,” added President & CEO Simon Woods. “Thomas Dausgaard has evolved through his career into an artist of extraordinary insight, with all the musical and technical skills to translate his ideas into the most inspired music making. In the current season Dausgaard will conduct two subscription programs beginning with an all-Brahms concert in January including the Haydn Variations, select Hungarian Dances, Liebeslieder Waltzes and Symphony No. 2. In June he will conduct Sibelius’ monumental choral symphony, Kullervo, presented alongside performances of traditional music by Finnish folk musicians. 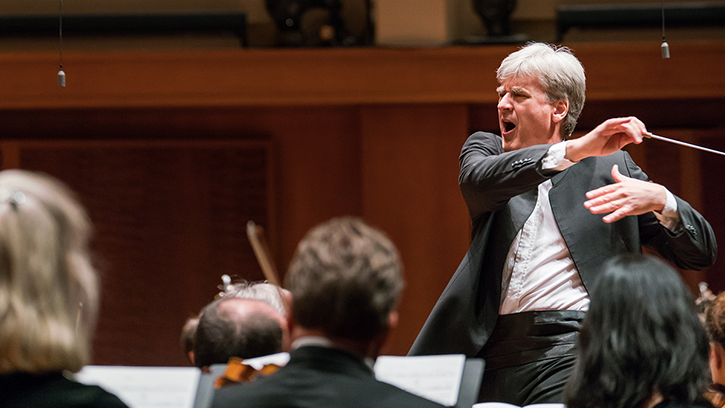 Please join us in welcoming Thomas Dausgaard to the Seattle Symphony! You can read his biography and watch him conduct the orchestra in performances of Brahms and Sibelius this season.